Enjoy up to total 22,000 FWC Points in exchange for a round-trip award ticket to Taipei. #Main Card cardholders are required to accumulate spending of or over certain amount in which includes at least 3 mobile payment transactions within first two months of card issuance in order to be eligible for the FWC Points welcome offer. 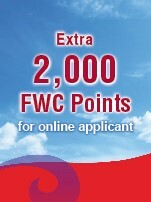 Extra 2,000 FWC Points for successful application through the e-platform. Extra 7,000 FWC Points for eligible accumulate spending over HK$20,000 within first two months of card issuance. *For each additional card successfully applied, the main cardholder will be rewarded with 2,000 FWC Points (Each main cardholder can apply for a maximum of 9 additional cards, i.e. the maximum entitlement of each main cardholder is 18,000 FWC Points). Gift points will be automatically converted into FWC points monthly. “BOC Hong Kong Airlines Visa Card” cardholders can have free access to “Club Autus” and “Club Bauhinia” at Hong Kong International Airport Five times per year with your travel companions on any Hong Kong Airlines flights. Terms and conditions apply. For details, please visit Hong Kong Airlines website at www.hkairlines.com. “BOC Hong Kong Airlines Visa Card” cardholders are entitled to enjoy 50% off flight redemption (applied to selected destinations and travel period) with Fortune Wings Club Points. Enjoy 5% off inflight duty free discount with purchase over HKD1,000 in single transaction for “BOC Hong Kong Airlines Visa Card” cardholders. “BOC Hong Kong Airlines Visa Card” cardholders can now enjoy discount on designated KKday products. Cardholders can redeem the offer when applying the promotional code by verifying 16 digits of credit card number at KKday designated website. “BOC Hong Kong Airlines Visa Signature Card” cardholders can join “Accelerate” with holding unused air tickets for flights which are marketed and operated by Hong Kong Airlines (except codeshare flights) with designated booking classes. “BOC Hong Kong Airlines Visa Card” cardholders can enjoy extra FWC Points on purchasing air tickets via Hong Kong Airlines website or Mobile App in a single transaction. HK$15,000 - HK$19,999 spending in a single transaction, enjoy extra 1,500 FWC Points, and so on. "BOC Hong Kong Airlines Visa Card" is a credit card with built-in contactless payment function. It allows you to conduct convenient transactions at any merchants fitted with a Visa payWave contactless payment reader worldwide. Simply tap the card against the reader to settle transaction of HK$1,000 or below without the need of signature verification. For details, please visit www.visa.com.hk.